In our forthcoming book, Click 2 Save: The Digital Ministry Bible, Keith Anderson and I share lots of examples of ministry leaders participating in social networking communities, not merely as church marketers honing the “perfect” message that will lure newcomers to their churches, but as engaged, pastorally experienced companions to people sharing their everyday lives. We’ve got digital dying and death ministry, advocacy for the socially and economically challenged, community-building during crisis, celebration of births and birthdays, minister-on-the-go digital mapping, and much more. Still, as churches become more comfortable with social media and especially as those in leadership roles get more proficient at engaging younger adults who place a particularly high value on authenticity and transparency both on- and offline, new ministry challenges are arising every day. Here’s one we didn’t include in the book that was brought to my attention by techno-savvy pastor Adam Copeland. How do you minister when people going through relationship difficulties share their troubles online? By now it’s pretty standard to note changes in relationships by way of a Facebook status change from “in a relationship” or “married” to “it’s complicated” or “single.” The minus-one on a list of friends will not-so-subtly get word quickly around a social network. In such cases, it seems appropriate to do what you’d do if you’d heard the news of the end of a relationship any other way. If it’s someone in your community, you’d probably call or email both people to offer support. You’d undoubtedly include both in your prayers. It’s no different when you get the news through a social networking site. It’s easy to imagine how the news of Katy and Russell’s split made it around their various social networks, where people might simply wince a little and hope the ruckus passes quickly. But the challenge for ministry leaders is different. Ministers are called to serve those in “any kind of trouble or need,” whether that’s expressed online or off. So, in cases like this, should you intervene in some way? Should you advise community members about how to respond (or not)? Does it matter if the people involved are in your social networks but not formally members of your churches? What are the boundaries to the support we might offer as people vocationally committed to doing God’s work in a world that keeps getting bigger and bigger? These are all tough questions, and we can only expect them to get tougher in the digital days ahead. What’s more, the questions will have to do not only with romantic relationships, lost jobs, and other personal dilemmas, but also with decidedly unchristian online behavior like hate speech and bullying. Surely such bad behavior has gone on in offices, schoolyards, and living rooms for eons, but it was largely invisible to most of us, separated as we’ve been by geographical space and physical walls. Do ministry leaders now have a particular obligation to speak against these in online communities rather than merely using them as you-won’t-believe-what-happened-on-Facebook-this-week sermon examples? Social media participation has clearly become a real part of the lives of almost every American in nearly every demographic grouping we might imagine. It’s not that we’re living our lives more online,but that the boundary between what we used to distinguish as “virtual” and “real” is simply gone. From the glee over cute piglet YouTube videos to the food celebrated on Foodspotting to the very intimate joys and heartaches shared on Facebook and Twitter, it’s all real. It’s all visible. The tremendous upside of this newly visible reality is that we have new opportunities to be more transparent with our faith without coming off as preachy or proselytizing. But the increasing visibility of our faith, especially for people in ministry, also has significant vocational consequences. It calls us to reflect considerably, and discuss with both colleagues and those we serve online and off, new expectations for and resulting configurations of ministry. This is the ministry challenge of the Digital Reformation, in the face of which we cannot responsibly just keep churning out sermon blog posts and scripture tweets as though a never-ending stream of spiritual commentary would take the place of the spiritual conversation and companionship at the center of ministry. How then will we take advantage of both our traditions and the opportunities presented by social media to remake ministry so it serves the world as it is today? 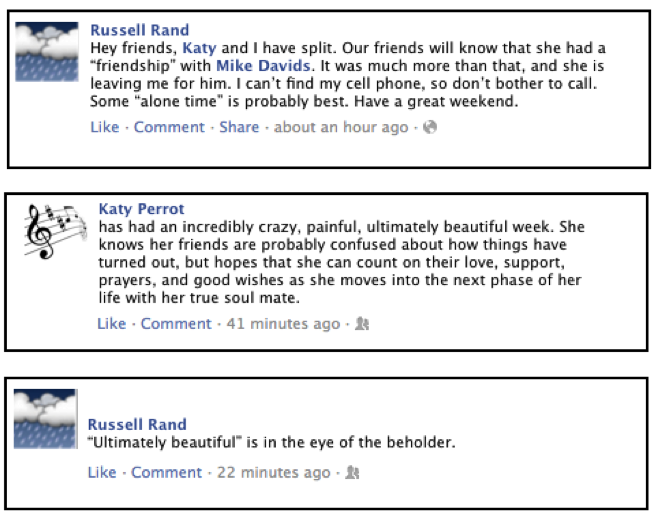 With regard to the ill-fated relationship of Katy and Russell, it seems that a local pastor did reach out—privately—to both, offering a measure of spiritual support and suggesting that they work through the end of their marriage offline. Some conversation took place between Russell and the pastor via email. That seemed to salve his anguish a bit and point him in the direction of more appropriate support through this life transition. It’s a good start. What approach might you take to these sorts of digital ministry challenges? Elizabeth Drescher is the author of Tweet If You Heart Jesus: Practicing Church in the Digital Reformation (Morehouse, 2011) and, with Pastor Keith Anderson, the forthcoming Click 2 Save: The Digital Ministry Bible (Morehouse, Spring 2012). She is a regular commentator on culture and technology for Religion Dispatches. She teaches religious studies and pastoral ministries at Santa Clara University, and is a member of the Commission on Ministry in the Episcopal Diocese of El Camino Real. Dr. Drescher’s current work on ethical issues in digital ministry is supported in part by a Hackworth Grant from the Markula Center for Applied Ethics at Santa Clara University.